Claims made about discovery of Charles Dickens' former home have been challenged. A book about Charles Dickens’ life in Cleveland Street written by a Cambridge historian and published by Oxford University Press (OUP) in February has been criticised after it failed to acknowledge previously published works. In Dickens & the Workhouse Dr Ruth Richardson uncovers new material about Charles Dickens’ life in nineteenth-century London. She discovers that many of the characters in Dickens’ books were based on real people living in and around Cleveland Street in what is now Fitzrovia. In the book she provides historical material that for the first time shows how the workhouse in Cleveland Street was the inspiration for Dickens' novel Oliver Twist. Dr Richardson’s work has been credited with being the main reason why the former Strand Union Workhouse was given listed status by the government last year and subsequently saved from demolition. She was internationally recognised for her work. Literary scholars may debate the merits of her argument that Oliver Twist was based on the Cleveland Street Workhouse, but Dr Richardson’s work has given new insights to the early life of Charles Dickens in Cleveland Street. However her claim to have discovered the location of Dickens’ former home in Cleveland Street and its proximity to the workhouse has been challenged because the information was available in previously published books which were not acknowledged. In Chapter 1 of her book Dr Richardson describes how she used existing biographical details which stated that Dickens lived at 10 Norfolk Street. She then compared old maps with newer ones and found that Norfolk Street had been re-named and was now Cleveland Street. 10 Norfolk Street is the same building as today’s 22 Cleveland Street. “So, Dickens had inhabited the same street as the Workhouse … and twice!”, she wrote. “A rigorous double-checking process had to be done, to prove to myself that all the details I had were genuine and really correct, and also to find out if anyone had done all this before.” She went further by saying: “But not a single writer could I find who mentioned the proximity of the workhouse”. She described how crucial it was to be certain about all the evidence and wrote: “We couldn’t go public with information of such importance without having verified it properly for ourselves” (p23-24). In a video on OUP’s YouTube site she describes her excitement about making the discovery. But Dr Richardson failed to properly verify that this discovery had not been made before, and OUP did not spot the error. Fitzrovia, by Nick Bailey, 1981. Dr Richardson initially responded by accusing Angela Lovely of not actually having read the book and that it was being judged unfairly. 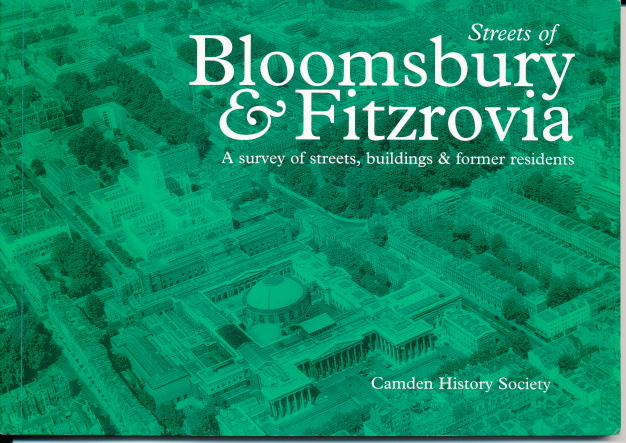 Fitzrovia News can now produce evidence to refute the claim made by Dr Richardson and OUP that the location of Dickens house was previously unknown and that no author had linked Dickens, Cleveland Street and the former Strand Union Workhouse. E Beresford Chancellor was an estate and land agent and had written many books on London. He was a Fellow of the Royal Historical Society. Dr Richardson is also a Fellow. While there is no reason to suggest that Dr Richardson deliberately ignored these books, it seems that she overlooked them and her publisher OUP failed to find these previous publications. Charles Dickens (left, middle) on the cover of Characters of Fitzrovia by Pentelow and Rowe (2001/2002). But how did a Cambridge historian and an Oxford publisher get it so wrong? OUP says “all books are ratified by the University before publication”. We told OUP that we had evidence to refute the claim of historical discovery about 22 Cleveland Street in Chapter 1 of the book and asked them to respond. We received a brief email from a spokesperson who said it was not their policy to respond to reviews and that they would be making “no comment”. Dr Richardson came so close to realising that Dickens having lived at 22 Cleveland Street was already known. By a twist of fate she would likely have passed the Fitzrovia Neighbourhood Centre metres from Dickens former home. In the window on display was the book Characters of Fitzrovia with a picture of Dickens on its cover. 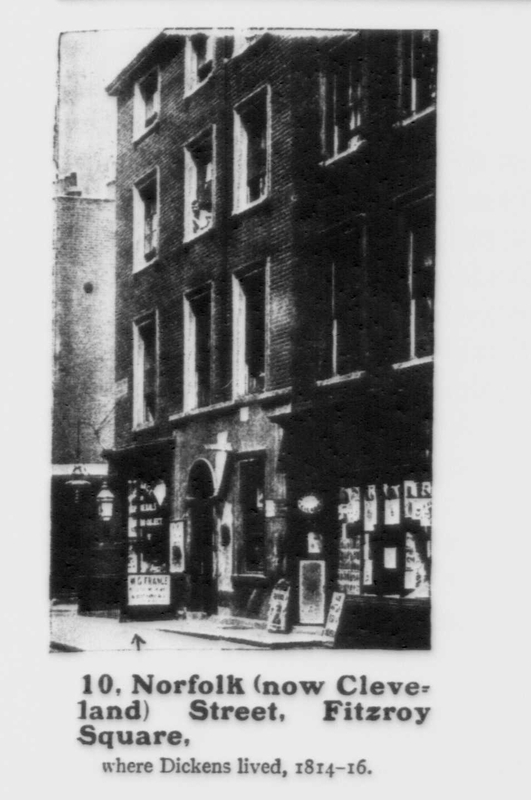 The Bookman in 1912 was promoting the Centenary of Charles Dickens’ birth and featured 22 Cleveland Street. 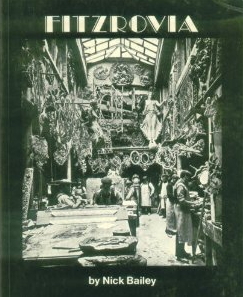 Picture courtesy of Camden Local Studies and Archives. Further research by Fitzrovia News has revealed that Chancellor may have referred to work by William Robertson Nicoll who edited a book trade journal called The Bookman published by Hodder & Stoughton. In 1912 an article appeared about Dickens and featured a picture of 22 Cleveland Street to coincide with the 100 years since his birth. 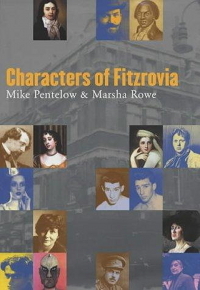 Note: a co-author of Characters of Fitzrovia is Mike Pentelow who is also editor of Fitzrovia News. 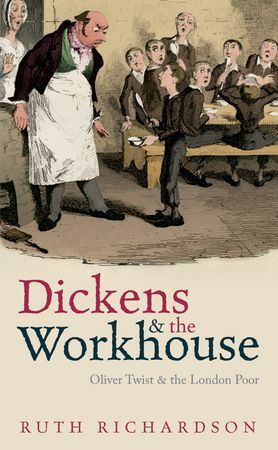 Dickens and the Workhouse: Oliver Twist and the London Poor, by Ruth Richardson was published by Oxford University Press in the UK in February and in the United States in March.